Pat Frank: The New Science of Climate Change | Wott's Up With That? “Pat Frank: The New Science of Climate Change“ (May 14, 2011). Anthony Watts’ blog buddy “John A” wants us to read chemistry PhD Pat Frank’s May 6th post on Jeff Id’s blog (ah, “social networking”). It proves that Global Warming is all just fiddling by them dang lyin’ climate scientists. They adjusted the early 20th century surface temperatures upwards to create the appearance of a late-century warming trend! What sneaks. This increase in rate wasn’t due to an accelerating late 20th century trend. It’s mostly due to modifications of the 1880-1920 record. Wait, haven’t the denialists been claiming that early instrument records were adjusted downwards to maximize apparent warming? Could it be that they’re adjusting in both directions at once? It staggers the mind. Pat Frank’s rigorous scientific technique is to scan the published graphics and convert them to numerical values. How this is supposed to inspire confidence in his conclusions remains unknown because Frank offers no discussion of the reasons for changing the data selection that produced the plots. I suppose that would take both knowledge of the details as well as scientific insight. 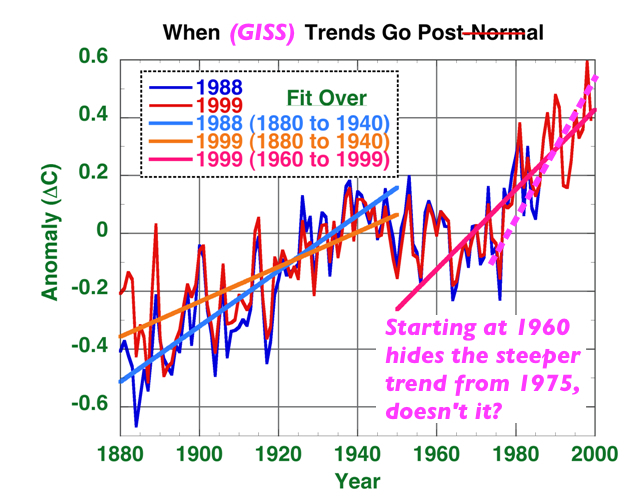 His accusation is that the earliest instrument data was ‘adjusted upwards’ by GISS from earlier presentations to fraudulently lower the slope of early century warming and make post-1975 AGW warming look comparatively steeper. So Frank adjusts the values in the direction that suits him by cherry-picking some starting points (What’s special about 1950? Nothing. ), adds in some x-axis squashing for more visual minimization, and declares victory. Now that’s post-normal. This all boils down to more accusations of “Post-Normal Science”, which denialists like to sling about when ever climate scientists refine their theories or improve historical analyses. Any change in “the record” is malicious don’t you know. I wonder why Frank doesn’t discuss Total Solar Irradiance, which was increasing during the early part of the century and level later in the century when all the Global Warming happened? After-all he does make a half-hearted stab at blaming the warming on “solar variation”. This entry was posted in Anti-Science, Numbers are Tricky, The Cherry Orchard and tagged Chart cheating by Ben. Bookmark the permalink.